At Valet Car Wash, we combine state-of-the-art technology and traditional knowledge to provide our customers with the best quality car wash. Our friction-based equipment ensures the best cleaning possible. The entire process begins with a visit to our Pay Station, where you can choose your wax and interior cleaning options. Once you select your cleaning package and preferred method of payment (cash, credit card or wash card), you're ready for your car wash experience! Once one of our friendly and knowledgeable attendants has loaded you into the wash, your vehicle will enter pre-soak and soap which are mixed at a precise concentration to ensure maximum dirt removal. 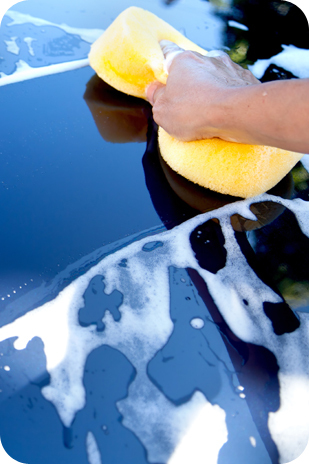 As you continue through the wash, your vehicle will be cleaned using closed-cell foam and microfibre equipment, guaranteed not to scratch your car. If you purchase our Express Protect or Express Extreme washes, you will receive a variety of extra services as you proceed through the wash. The Express Protect wash gives you undercarriage spray (great for removing built up salt and road grime),and extra high pressure rinse (great for removing salt and road grime). Express Protect top cleaning, extra side cleaning, spot free rinse and as well as triple foam protection polish (protects against UV rays, salt and road grime), Rain coat protection. Our Extreme wash includes all the great features of our Express Protect wash, as well as Fire and Ice from Turtle Wax and a new 72 hour Clean Car guarantee and a tire shine to give your wheels that new look. Our Express Plus Protection and Extreme wash all finish off with a spot free rinse, the purest form of water in existence, and is dried to perfection by our high speed blowers, guaranteed to get your car 90% dry. The entire process takes 3 minutes, and we guarantee you will be 100% satisfied each time you visit!